I have a friend named Josh. He holds many irrational beliefs. For an adult named “Josh” this can be expected, but he pushes irrationality to its uppermost limit. For example, he has declared empathically and unequivocally that Bruce Willis is a great actor. Not movie star mind you, but actor, as in ack-tore with a capital A. Now I like Bruce Willis as much as the next guy (not at all), but I think we can agree that he is no great actor. Movie star? Maybe. But actor? Let’s be serious. Bruce Willis has played exactly two characters throughout his film career. The first is a tough guy who more frequently than not is smarmy (Die Hard, et al). And the second is a ghost who does not know that he has died (Look Who’s Talking). Another brief example lies in the greatness of Val Kilmer (Josh is really into movies). Again Val Kilmer is not great. He has been in a handful of good movies (if you count Tombstone four times). He can stand and recite lines of dialogue and almost seem like a person but that’s about as far as he can go. And lastly, he believes Krull is one of the greatest films of all time. Yes. Krull. If you haven’t seen it in a while (or hopefully at all), it’s the story of a spaceman with a magic boomerang who something something something. I blacked out a little just writing that last sentence. Actually it’s more like if you let an autistic kid write and direct an 80s movie with a $100 budget having just read the Lord of the Rings and then watched Star Wars. It is the opposite of all that is good and joyous in the world. 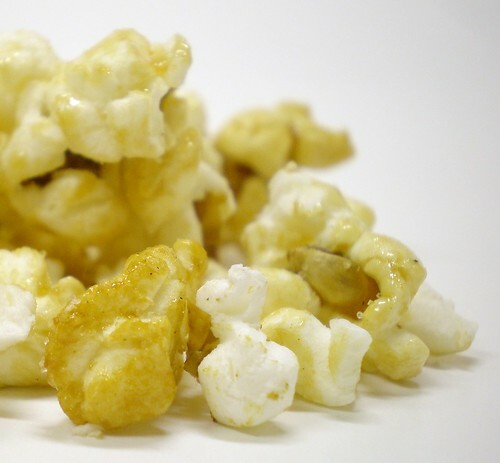 Now on the surface, the idea of caffeinated popcorn seems irrational. Granted. 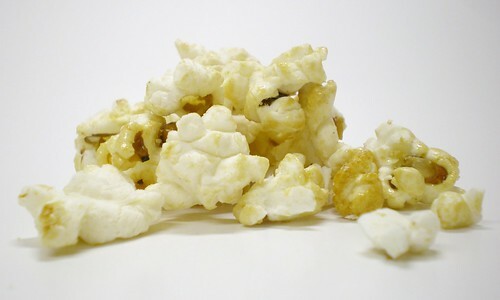 Popcorn is a light and airy snack that has been around since at least the 70s and has worked pretty well. The butter syrup, the caramel shellac, the cheese dust. You love it, I love it. Surely the addition of a caffeinating agent can only lead to weird taste and an overabundance of covering flavors. Well my good friends, I can declare emphatically and unequivocally that this is not the case. 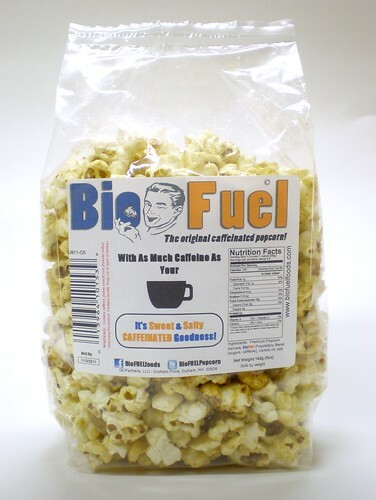 BioFUEL has managed to caffeinate the popped kernel very nicely. 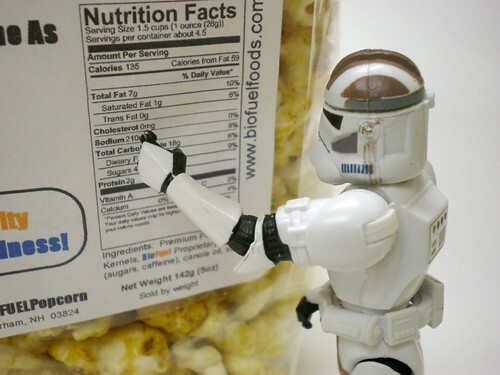 This popcorn, salted and sweet, is well balanced with no hint of chemical freakishness. The saltiness dominates the sweetness in the end but neither will overpower you. The flavor is not a dust or powder, but a very thin caramel like coating. Think that stuff in those industrial Christmas tins but much much lighter and not as jarringly crunchy. It is good and I very much enjoyed the bag. My only complaint is that the caffeine content is a little nebulous. One five ounce bag contains as much as a “strong cup of coffee.” That leaves a wide margin of milligrams, and I’d prefer to know the number. So next movie night why not supplement your delicious Cherry Coke caffeine with some popcorn caffeine. You’ll feel great and it might even give you that extra jolt you need to make it through The Whole Ten Yards (not likely). In conclusion, is caffeinated popcorn irrational? Yeah, probably. But if you can pull it off and have it taste good, should you do it? Why the Krull not.